I can’t not start this article without congratulating all the Vettel and Red Bull fans out there – I know I am personally grinning from ear to ear. Whether you’re a fan or not it has to be said that Sebastian Vettel is going down in history as one of the great Formula 1 drivers. His performance again on Sunday was first class and he deserves his fourth consecutive World Championship title. I was surprised to see Seb pit so early in the race and was concerned about the traffic up ahead for him after rejoining the pack in P16. But by lap 13 Vettel had made his way through the field and was sitting pretty in P4 with the other drives in front still due for pit stops. After Mark’s car had to be retired after an alternator problem (seriously, how unlucky is this guy) I was biting my nails hoping that Seb’s car would last until the end. The German was told to turn off his KERS as well as stop sipping water in order to try and avoid any problems. I can only image the tension in the team on the Pit Wall. However it was smooth sailing for Vettel who finished the race in style to clinch his fourth consecutive World Championship title. 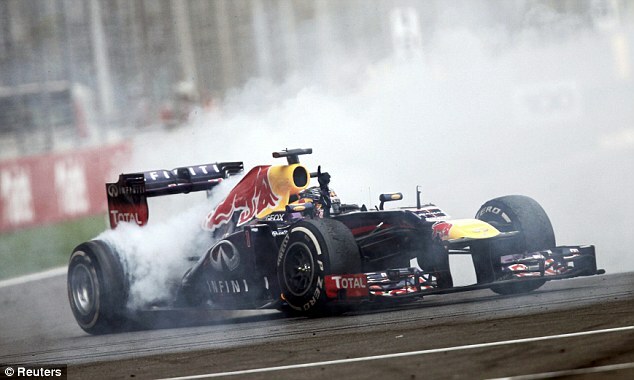 He celebrated in style doing some doughnuts on the start finish straight for a roaring crowd – for which he was reprimanded by the stewards. Peeps need to lighten up, he just won another World Championship title, a few trick displays are great for the crowd and the sport. Seb aside, let’s get into the other bits of the race, which I found really enjoyable. 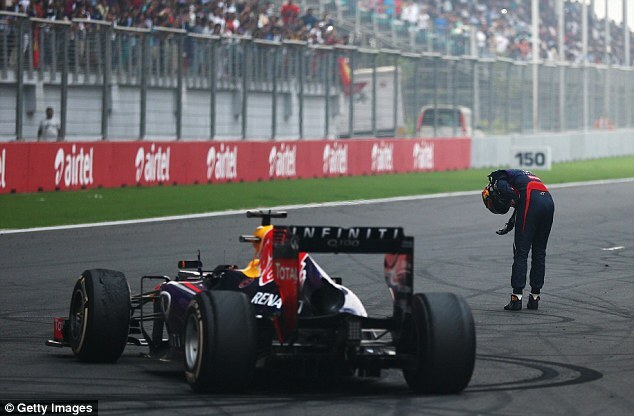 It’s a pity India won’t be on the calendar for next year, I quite like this track. The first unlucky person I want to talk about it Alonso. The poor guy got tagged in turn one by Mark Webber, which caused damage to his front wing. The very next turn wasn’t any better for the Spaniard, which saw him bumping rather hard into Jenson Button. Alonso had to come into the pits for a new front wing which saw him pushed back to P20 and ended the race in an unremarkable 11th place. Teammate wars continued in Lotus, with Kimi making it rather difficult for Romain to pass around lap 56. Grosjean was pushed out wide off the tarmac and had to give the place back to Raikkonen, all the while with Massa closing in on them both. The Frenchman sounded rather irate over his team radio about his teammates risky moves. I can’t wait to see how Alonso and Kimi get on next season. Nothing like a little teammate friction to make things interesting! I thought Massa did really well and most certainly held his own against Alonso. I feel rather bad for him not having a team yet for next year, but rumours are he is in talks with Williams for a drive next year. Speaking of next year – how bizarre is Torro Rosso’s newest signing of 19 year old Kvyat? I suspect the Russian comes with some hefty sponsorship money behind him, why else would a F1 team be interested in a rookie from GP3? I shall be watching this one next year – wonder how he will fare with the hefty jump from GP3 to F1. With the season pretty much wrapped up I’m looking forward to the last few races. See you next week in Abu Dhabi.